Not to be too cute with the syntax, but it looks as if George Bush is going to make John Bolton a recess appointment as Ambassador to the U.N. If you can’t get a nominee confirmed, then bolt on whatever you can, seems to be the president’s approach, no matter how messy the carpentry. The ability to make recess appointments was designed to allow important jobs to be filled when Congress is not in session. Meant to stop-gap vacancies created by death or resignation, it’s stretching the intent of the law to use it for a blocked nomination. Having said that, of course it’s been done before by other presidents. Bolton is not only controversial in this country. The entire U.N. membership follows America’s ambassadorial selections very closely and they don’t like this one, not because he’s tough . . . there are a number of members who agree that tough is what’s needed right now . . . but because he’s ham-handed, arrogant and listens to no one in the pursuit of strictly personal prejudices. Our ambassador simply cannot function within the kind of controversy Bolton has gathered. Even had he eventually overcome the very public agony he suffered in confirmation hearings, he’d have been a lame duck and Bush should have offered an alternative a long time ago . . . an equally tough negotiator, but much less controversial. There’s little doubt the recess appointment will occur. “Administration sources” close to Bolton say that he’ll accept such an appointment and we all know that administration sources never lie, they just fade away. So, he’ll be in there for better or worse until this Congress gavels its final adjournment at the end of 2006. Never one to stay idle, John has been busily rearranging and enlarging (to double its size), the office space within the State Department reserved for the U.N. ambassador. 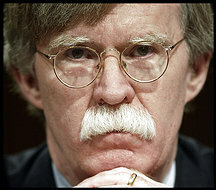 Pretty cheeky, but then John Bolton is a cheeky guy.